Jewelry making is a great way to make money, and one of the best things about it is that you can do it out of your own home. 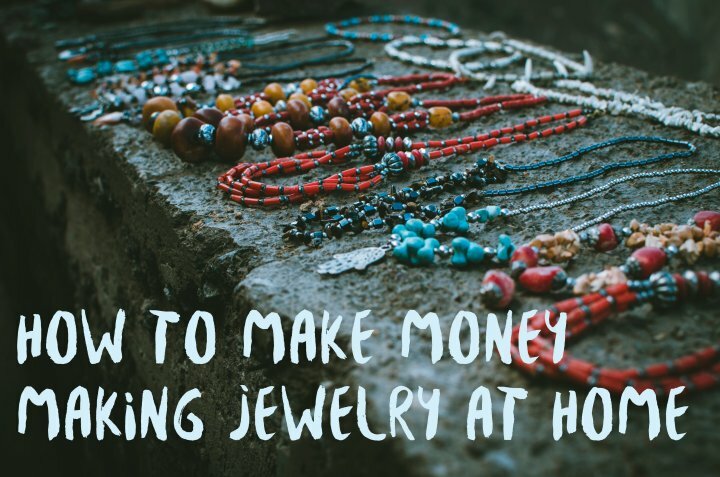 Whether you are looking to earn just little bit of extra pin money each month, or eventually make it a full-time source of income, making jewelry can be a great way to earn money. One of the best things about jewelry making is that it doesn’t take a big investment to get started. You can create inexpensive jewelry with low-cost materials or even use recycled materials to create completely unique jewelry. 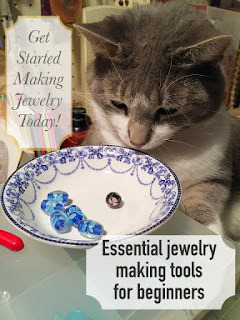 Even though you don’t need a big investment to get started making jewelry at home, you do need to know how to get started, so today I am going to offer some advice for how to do just that. I have been making jewelry full-time for over 20 years. I have lots of experience. I have sold my jewelry at craft fairs, art shows, in art galleries, in museum shops, and online in various different selling venues as well as on my own website. I didn’t go to school for jewelry making, I taught myself everything I know, and now, years later, I am the author of two traditionally published best selling jewelry making books, as well as two best selling jewelry instruction DVDs, all contracted with a major publisher who is the leading publisher in the industry. I can begin by telling you that there is no magic, secret recipe to doing it right. What I can tell you is that it takes a lot of blood sweat and tears, plain old hard work, the ability to take chances and the ability to fail and be resilient and start over again to be successful. 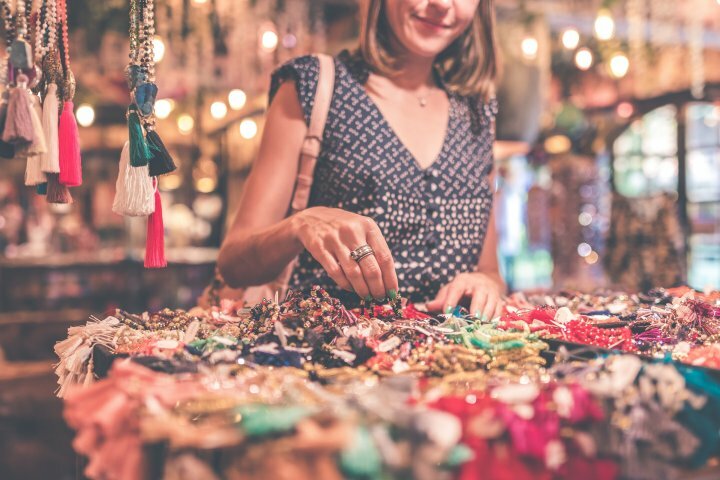 To start your own jewelry business at home you will need a creative spark, so it’s also important to know how to nurture your own creativity, to take chances in that realm, and to not be afraid to be different and try new things. If there is one thing that could be considered a “secret” to success, it’s being different from everyone else. I’ve talked about this, and I’ve talked about creativity, and a few of my past blog posts, and I will talk about it again in some future blog posts, but for now, let’s get started talking about how you can get started making jewelry at home. 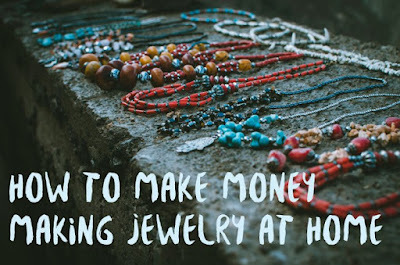 This article is going to be a basic rundown of how to get started making jewelry at home. It is by all means not everything in the world that you will need to know, but consider it a great springboard to getting started! One thing I want to say before I get started is that I am active on social media and I am an active reader of all kinds of craft articles and blogs and magazines, I keep up with my industry and with what people have to say, and I’ve noticed there are lots of blog posts that I seem to come across (mostly via Pinterest) that will talk about how to get started with crafts or jewelry, or how to do craft shows, and disappointingly I have found that an overwhelming amount of these articles do not offer much good advice at all and are really just fluff that seems to be written to fill empty blog spaces. I know that might sound harsh, but I have to point it out. Do not take advice from people who do not have years and years of experience! If you want good advice, you have to talk to someone who actually knows what they’re talking about, who has walked the walk and talked the talk! So this is just a heads up to be careful about what you read out there on the interweb, because not all of it is good, practical advice! Making jewelry at home, or any craft or art, is a true labor of love. First and foremost you have to enjoy what you’re doing, you have to have a passion for it, you can’t just do it “for the money“ because that will show through in your work. You have to do it because you want to do it, because you love it and enjoy it and because you want to share that with other people. If you go into it with this mindset, you are off to a good start. This is the first question that you will need to answer. What is it that you want to make? For this article I’m going to focus on jewelry making, but the advice in this article can be applied to any craft or art, so keep that in mind. But what do you want to make? I’m guessing you are here because you are interested in making jewelry. That’s great! But I want to know: what type of jewelry do you want to make? Not sure where to start? Think about all the different types of jewelry that there are. There’s very trendy jewelry whose styles are always changing. There is beaded jewelry that uses glass beads. There is beaded jewelry that uses semi precious stone beads and pearls. There is jewelry that is made from recycled components. There is jewelry that is mostly made with wire. There is mystical jewelry that is made from crystals and in which the stones are chosen by their metaphysical properties. There is jewelry for weddings and bridal parties. There is jewelry for teens and tweens. There is jewelry for men. There is jewelry that follows certain styles such as Retro, Victorian, Art Nouveau, and Modern, to name just a few. There is jewelry made with natural components such as wood and shells. There is jewelry made from plastics, resin, and from handmade beads. There is large, artsy statement jewelry. There is delicate, demure, feminine jewelry. There is jewelry for just about any interest that you could think of: sports, pets, travel, nature, the list goes on and on and on. What kind of jewelry do you want to make? Make what interests you, but make sure that it will also interest other people, or you will not be able to sell it. What I’m saying is, you want to create something for some type of audience who will want to buy it, but at the same time, you want to enjoy making it too. You can’t learn jewelry making without having some tools and jewelry supplies in front of you. This is a hands-on craft which requires you to go through some trial and error, creating and learning while you go. For the most extreme beginner, you will want to start with some very inexpensive components such as inexpensive wire and glass beads. Save the precious metal wire (silver and gold) and fancy stuff such as crystal, stone and semi-precious beads until you’ve got your techniques down and your jewelry is looking very good and you feel confident in taking the step towards more expensive materials. Everyone starts this way, even the best designers started right where you are today! So don’t worry, just take it step-by-step and you will be fine. Go to your craft store and ask a knowledgeable sales person to show you the most inexpensive craft wire and jewelry making components. Tell them you are just getting started and that you need the very basic beginner supplies for practice, and I’m sure they’ll be glad to help. Hint: Instead of buying sterling silver wire, go to your local hardware store and buy a few feet of copper wire in a few different gauges. Use this wire for learning and practicing your jewelry making techniques. If you have the opportunity to take a class in jewelry making with some very basic jewelry techniques, that’s a great place to start because you hopefully will have an instructor who will be able to offer you some one on one hands-on help and instruction. If not, no fear, you can teach yourself. All you need is some patience and ambition. You can find basic jewelry making books at most libraries, And YouTube offers tons of jewelry making videos. You may have to spend some time weeding through the bad ones—and unfortunately there are plenty where you can’t hear the person talking or you can’t see what they are doing—but there are also a few good ones out there so YouTube can be a great resource for a beginner. If I have time I will try to get up a few videos on my own YouTube channel showing some very basic jewelry techniques. So know that there are plenty of free resources and that’s all you really need to get started. As for tools, there are tools that are “need to have” and there are tools that are “nice to have.” Check out this article I wrote a while back where I talk about these two different types of tools. Of course, The tools you will need are determined by the type of jewelry you are going to make. For example, you do not need to buy a pair of crimping pliers if you are not going to be making bracelets or necklaces with beading wire, where the use of crimps and a crimping pliers is a necessity. You most certainly will need a pair of long nose pliers or rosary pliers and a pair of chain nose pliers as well as a side cutting pliers for most types of jewelry making. If you are going to buy beads you will also need some bead storage containers from the get go. I know it is a lot of information but just absorb it bit by bit! This is important. Right when you get started, you need to save all of your receipts and you need to have some kind of a notebook where you can jot down some very basic information to keep track of what you spend and how much things cost. This is important for two reasons. 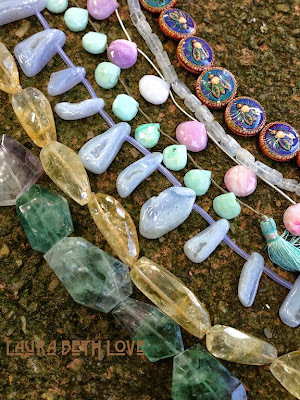 First, you will need all the receipts for your taxes, and second, knowing how much you spent on all of your beads and components (and even your tools) will help you price your jewelry when the time comes. I have to admit, I slack at doing this. I usually just pull a number out of the sky when pricing my jewelry, but I think that's just because after all these years I pretty much don't have to write it down anymore, I just sort of know what I spend and how long it takes me to make a particular item. This may seem like a lot to do but once you get into the habit it really is nothing and you kind of do it automatically. When you get into the habit of doing this every single time you buy a supply, by the end of the year when tax time rolls around, you will find that you have saved yourself a ton of work because you already have everything written down in one place, ready to be added up. Make doing this a priority and you will be saving yourself a ton of work down the line. As for keeping track of what you spent on supplies to later figure out how you should price your jewelry… Many people do this. Like I said a little while ago, I kind of just figure out a price in my head but maybe that’s because I’ve been doing this for so long. But what I meant by that is, let’s say you buy a strand of beads that cost $20. When you get home from the store, the first thing you are going to do is count the number of beads on that strand. For the sake of making this explanation simple, let’s say there are 20 beads on the strand. You spent $20 and got 20 beads so that means each bead cost you one dollar. You can use a notebook to write this down and keep track of it or you can do a spreadsheet on your computer, whatever works better for you. When I did this I used to always just keep it in a notebook because it was much easier to quickly flip a notebook open than it was to turn my computer on and then open up the file to find the spreadsheet etc. etc.. Sometimes the old fashioned way is actually the easiest way! You have to do what works best for you! But in the beginning you really should keep track of what you are spending and how much those components cost, even the tiniest that seems the least important, because in the end it all ads up. Once you put together a piece of jewelry—let’s say a bracelet—you will have to take a good look at the finished bracelet and figure into your price what you spent on all of the materials that went into making it: beads, beading wire, crimp beads, the clasp. Then you add something for the work you put into it on top of that (paying yourself) and that is how you figure out your price. You need to pay careful attention to this so that you can make a profit. Make sure that you keep track of all costs and expenses. All of those things will go into determining your products price. Adding on to what I touched on earlier, you want to begin with inexpensive supplies. Some of you reading this right now who are already jewelry makers who already have beads can attest to these words: it’s really easy to buy lots of beads! LOL proceed with caution! If you’re shopping local craft stores, use those 40% off coupons that they publish in the newspaper every week, and nowadays they will most often scan them right off of your phone, so download those apps for those stores. Later, when your hobby turns into more of a job and you find yourself getting ready to do craft shows, you will want to get a sales tax license from your state and make sure that you cross all of your t’s and dot all of your i’s so that you are in compliance with whatever your local and state and federal laws are. But not just that, you should get a resale certificate so that you can buy beads and supplies at discount wholesale prices from those who offer wholesale to buyers. You will not be able to buy wholesale unless you have that certificate that shows the merchant that you are a retailer. Wholesalers also usually sell in bulk, so you may have to buy a certain amount of an item, such as a gross, to qualify for wholesale pricing. So by this point you have a pretty good idea of the particular type of jewelry you want to make. You’ve purchased some basic tools and supplies and have started learning how to make jewelry. You’ve been practicing, and you’ve been getting better at making jewelry each day. You’re keeping track of what you spend and your expenses, and you have applied to your state for your resale certificate so that you can legally sell your jewelry as well as purchase supplies at wholesale prices. Once all of these things start to come together, you want to think of a name for your jewelry making business. You may also want to think about a simple logo, as well as the image you want to project for your jewelry making business, as well as what type of packaging you are going to use. At this point when you are getting ready to sell your jewelry, you are going to also want to order some business cards and packaging. Now is when the real adventure begins. It’s time to sell your jewelry. I highly and I repeat – I HIGHLY recommend everyone begin with craft shows. You need to sell at craft shows. You need to expose your jewelry to people at a live event so that you can see their reactions and you can get their feedback. It is so important to discover what people like and do not like about what you are making. That will help you so much. I can’t tell you how many times I have gotten great suggestions and ideas from people walking by my jewelry booth. You cannot look that information up anywhere on the Internet! There is no substitute for that live feedback that you can only get at a live show. You will gain so much experience that I can’t even begin to go into how that will help you in the future. You will make mistakes and learn from them and you will do things right and be really proud of yourself! You will also meet other artists and crafters and that is so much fun. Not every show will be a successful one. Everyone has been to their share of flops for one reason or another, but for every poor show there are a whole lot of great profitable shows as well! Here’s a link to my earlier blog post, how to prepare for your first craft show. It’s here for you for when you need it. I wish you lots of luck and as always, be creative!